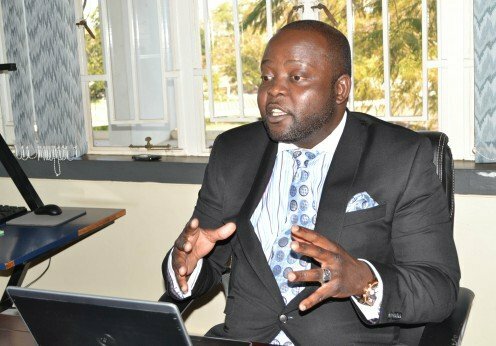 Malawi’s ailing former budget director, Paul Mphwiyo is expected to appear in court together with three others in a case they are answering charges of defrauding about K2.4 billion in 2013 through various businesspersons without rendering services or providing goods to the Government of Malawi. He (Mphwiyo) was netted last weekend by the fiscal police. The four finally appear in the High Court today where bail applications will be expected of them to make. JB’s saint: Paul Mphwiyo will be in court. Mphwiyo is together with three other suspects Auzius Kazombo Mwale, Clemence Mmadzi and Roosevelt Ndovi charged with seven counts. According to prosecuting lawyer Dennis Chipao are answering amended charges. Chipao said the State brought the suspects to Lilongwe Magistrate Court on Monday after their arrest on Saturday “ for committal” of the case to the High Court. Senior resident magistrate Chisomo Msokera committed the matter to the High Court forthwith. Mphwiyo, David Kandoje, Kazombo Mwale, Mmadzi, George Banda, Michela Mphatso, Samuel Mzanda and Maxwell Namata are facing charges of fraud, negligence by public office, money laundering, theft by public servant, theft by servant and conspiracy to defraud government amounting to K2 446 817 450.49. Commentators argue that the plot to kill Mphyiwo unmasked ‘casual’ looting of funds at the capital hill, a development that forced Malawi’s donors to pull out of aid. The current regime has been attributing the socioeconomic woes hitting the country now to Cashgate. God spared his life so that the truth should be known. Surviving bullets fire from short range in the head is a miracle. We could have lost this dude as we sadly lost our brother njaunju of ACB. We don’t know who killed him and why? Tsaya la Mphwiyo lili ndi maginito. Silver ili yonse imakakamira pa tsaya pawa tatewa. kuyendesa boma nkovuta sizibwana ndaonera awa eish kukanika chilichonse! Onse a CASHGATE angophedwa basi chifukwa okubayo ndiye okuphayo chodikila ndichani pamenepa. Asanamizilenso kudwala ayi kapena kumayenda ndi wheelchair ayi. Ena ndi awa akukakamila kunja ngati ndikwawo. Akuwopa chani kuno ngati kulikwawo? Hede e ulu! This guy should not dare to give us tough time in court cos despite stealing our money,we further saved his life.Ok if he tries,call me instantly,i gonna clamp his…..?cut the left…….? 2billion ndalama yathu? amangidwe basi! The bottom line is…his life was spared by a whiskers miss. God had plans. No bail for Mphwiyo.Akalowe basi ampeze Lutepo. Where Is The Elephant? R U Playing Hide & Seek Game? We Need The Big Fish In This Case.Don’t You Know That The Number Of Subsidy Benefisheries Has Dropped,donors Have Shorten Their Hands? Just Because Of These Greedy People! What will happen if Kasambala and Mphwiyo can be locked in the same cell? Naoni ameneo… so where are other thieves are they only ones?